Russia’s UIC will present its latest products in aircraft communications systems at the Aero India-2015 in Bangalore and will also hold talks on modernisation of equipment for the Su-30MKI fleet in the Indian Air Force. The United Instruments Corporation (UIC – a part of Rostec) will showcase its latest developments and innovations in the field of aviation communications equipment at the Aero India-2015 air show in Bangalore, which will be held February 18-22. The Russian giant will also hold talks on the modernisation of equipment for the Su-30MKI fleet in the Indian Air Force, said the press office of UIC. 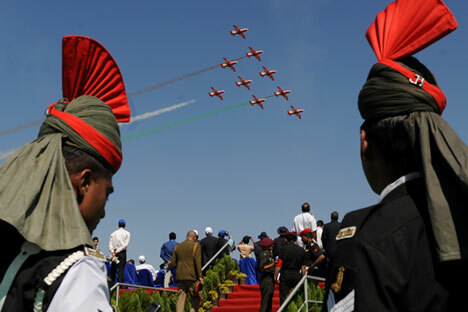 The International Aerospace Exhibition Aero India has been held every two years in Bangalore since 1996. Traditionally, this show is attended by the crème de la crème of the aerospace industry. According to the official website of the air show, in 2013, 570 companies from 29 countries participated in the show. At the international exhibition in Bangalore, the United Instruments Corporation will be presenting advanced developments in aeronautical radio communications, some of which may be of great interest to Asian companies, said the company’s press service. During the exhibition, talks are also planned with representatives of the Indian Air Force and Indian experts from the HAL Aircraft Corporation. The two sides are expected to discuss the possibility of upgrading the communications equipment in the Su-30MKI, now serving in the armed forces of India. “They will also discuss the possibility of supplying modern communications systems for the Russian-Indian aircraft currently under development – a multi-purpose fighter (FGFA) and the multi-role transport aircraft (MTA),” company announced. “Our Asian partners are simultaneously interested in several Russian products made by the NPP Polyot OJSC. One of the latest developments is the aircraft communications complex S-112, which provides a new level of efficiency in data transmission,” said Sergey Skokov, Deputy General Director of UIC. “In addition, in India we will be presenting the ground complex NKVC-27 for multi-voice communications and information exchange between command posts and tactical aircraft,” he added. At the Aero India-2015, the corporation will also be showing the on-board C-404 communications complex, produced by NPP Polyot OJSC, with an integrated antenna system designed for the Ka-62 helicopters and some other types of civil aircraft. Another development by NPP Polyot OJSC, which will be shown in Bangalore, is the air-information exchange terminal AT-E. It solves all tasks in the spheres of communication, navigation, identification, and management of the various branches of the armed forces, but primarily in aviation. The UIC is a state-owned corporation that was established in 2014 as part of Rostec, for the organisation of high-tech production in the field of technology and communications systems, automated control systems, electronic warfare and robotic systems for the army and other special units, as well as competitive dual-use products. The corporation consists of Vega Radio Engineering Concern, the Sozvezdiye Concern, the integrated structure “Control Systems” and the Central Research Institute of the Economy, Informatics, and Control Systems. The conglomerate comprises 55 companies and research organisations, and employs 39,500 people.